To help environmental researchers who measure solar radiation improve their measurements and simplify their lives, Campbell Scientific and Apogee Instruments teamed up to develop a new sensor. This new sensor combines features from higher-end blackbody thermopile pyranometers and lower-end silicon photocell pyranometers. The CS320 Digital Thermopile Pyranometer offers a high level of accuracy, while keeping the cost competitive with silicon photocell designs. Obtaining accurate measurements for solar radiation is important for environmental researchers because it can have a significant impact on their understanding of the natural world. This understanding is often critical to communicate to various stakeholders of that research. For example, overestimating or underestimating solar radiation impacts the estimated evapotranspiration in crop water stress models developed by scientists and used by growers for running their businesses. Overestimation could cause more water than needed to be applied to crops, depleting a scarce or expensive resource. Underestimation may cause crops to be overly stressed and not grow properly. Either can result in poor yields or crop quality, which affects growers’ bottom lines and impacts our global food source. We expect this new sensor will ultimately benefit scientists, researchers, and humankind by helping when measurements matter. Did you know that your pyranometer’s accuracy may be significantly affected by the current sky conditions? Many pyranometers use silicon photocell elements that sub-sample the solar spectrum rather than directly measure the whole spectrum. This technique works well on a sunny day because the sensors are calibrated under clear sky conditions, resulting in an accurate prediction of total solar radiation. Unfortunately, this technique can also result in errors under cloudy or overcast conditions. As you can see in the graph below, cloudy conditions cause a change in the solar spectrum. 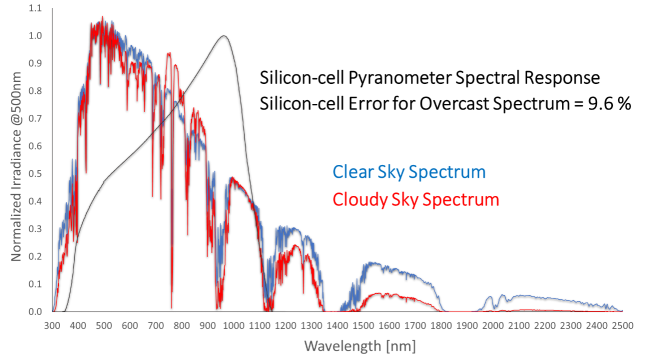 Silicon-cell detectors don’t account well for changes in the solar spectrum under cloudy skies because most of this change occurs outside the sub-sampled range. Click the graph for a larger image. Data source courtesy of Mark Blonquist, Chief Scientist, Apogee Instruments, Inc. Some measurement sites may rarely have clear skies, and the error caused by overcast conditions can be as great as a 15% overestimation of short-wave radiation by silicon-cell sensors. 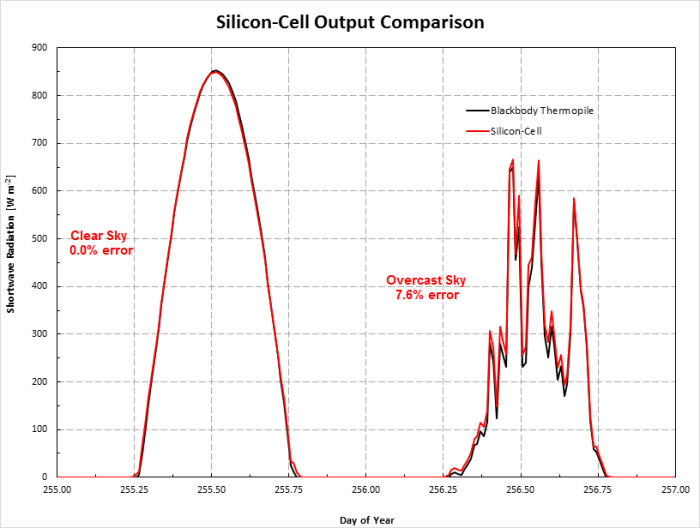 The graph above shows an instance when the spectral change on an overcast day resulted in an overestimation of approximately 10% when measured with a silicon-cell sensor. Because we realize that environmental researchers are not fair-weather-only researchers, we designed the CS320 to measure incoming solar radiation and operate in all weather conditions—not just clear skies. The CS320 uses a high-grade blackbody thermopile sensing element that is sensitive to the full spectrum of solar radiation. The sensor’s internal circuitry converts the millivolt output to a solar energy value that has been individually calibrated using a secondary standard pyranometer traceable to the world radiation reference in Davos, Switzerland. While lower-cost silicon-cell pyranometers are being sold today, their accuracy specifications do not compare with the accuracy of the CS320 under all sky conditions. To illustrate the difference in accuracy, the following graphs show measurement samples of solar radiation on consecutive days. The first is a clear, sunny day; the second is an overcast day. Measurements with a silicon-cell pyranometer compare favorably with a high-end blackbody sensor in clear conditions; however, there is considerable error on an overcast day. 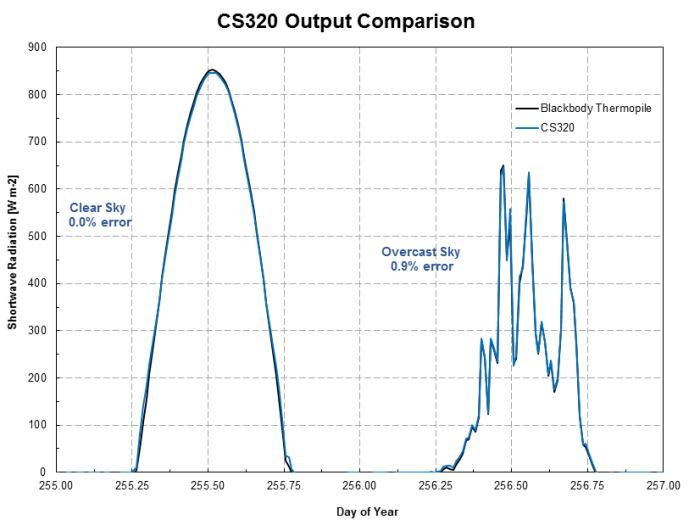 The CS320 measured solar radiation on the same consecutive days and shows a dramatic improvement in measurement accuracy in overcast conditions. Additionally, a couple of the CS320’s design features help the sensor continue making good measurements year-round. The dome-shaped head of the CS320 is designed to be self-cleaning for maintenance-free operation. This sensor also has a built-in heater that is controlled via an SDI-12 command. This low-power heater keeps the diffuser free of dew, frost, snow, and ice. Various features of the CS320 Digital Thermopile Pyranometer are intended to simplify your solar radiation measurement application while providing you with best-in-class performance at a reasonable price. The digital interface (SDI-12) of the CS320 simplifies the programming and wiring of the sensor to any current Campbell Scientific data logger. Because the analog-to-digital converter is placed inside the sensor, the calibration coefficients are also programmed inside the sensor. This eliminates the need to change your data logger program for each CS320 sensor being used. Also, with the detachable cable, you can quickly swap out CS320 sensors when they are sent in for calibration. The digital CS320 sensor provides useful data beyond the solar radiation measurement. A built-in temperature sensor on the measurement board provides a reference for temperature corrections and allows for improved heater control. In addition, each sensor has an embedded 3-D tilt sensor that allows it to report the x, y, and z coordinates for orientation. This determines how level the sensor is and if the senor has moved. This diagnostic tool is important, as pyranometers must remain level to produce accurate global solar radiation data. 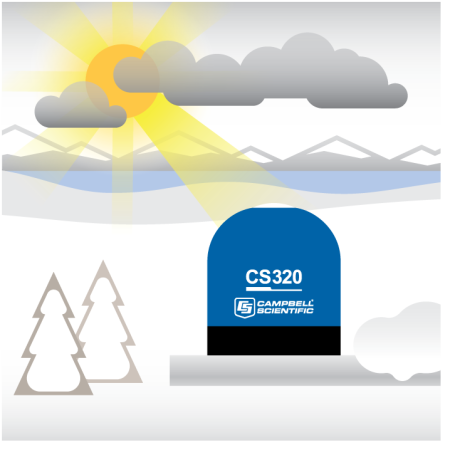 The CS320 has been designed to improve the global solar radiation measurement over silicon-cell pyranometers, but maintain the same cost. This digital thermopile pyranometer is suitable for applications ranging from environmental research to agriculture to large mesoscale weather networks (mesonets). If you have any questions about the CS320, please post them below. Chod Stephens is the Technical Product Manager in the Environmental Group at Campbell Scientific, Inc. Prior to working at Campbell, Chod was employed as a Research Technician at Utah State University where he also received his master’s degree in soil physics. I am waiting for a Solar radiation sensor that have a builld in tilt sensor a long time. Now it is coming. Great! CS320 has an embedded 3-D tilt sensor. could you tell us if it use the orientation information to calibrate the measurement radiation data? Or can we do can in our programs? Thank you for your question about the CS320 and its built-in tilt sensor. As of right now, the information from the tilt sensor is only being reported to the user. The sensor's calibrated response is assuming that the sensor is mounted level and pointing up. I don't anticipate using the data to correct for errors imposed by an improperly installed sensor, but you may be able to use the data in your datalogger program for anything that you would like. Thanks again for the question. Hi Chod, I am echoing the previous comment a little, but we are considering installing this sensor on an ocean buoy. You wrote "I don't anticipate using the data to correct for errors imposed by an improperly installed sensor, but you may be able to use the data in your datalogger program for anything that you would like. " Do you have a method or know of one that is used for correcting the data using the output from the tilt sensor? Essentially, has someone else already done the hard work of determining the effect of tilt on this sensors output?